The Portronics 'mBell' is a Wi-Fi connected doorbell that can be recharged via a USB charging port. Portronic has launched its 'mBell' 'smart' doorbell, which is priced at Rs 10,999. The device can be connected to your Wi-Fi and it can stream video directly to your smartphone. It is also rechargeable, streams the video in 720p HD quality and allows for talking to the person at the door as well. Portronics launches one the most intelligent home and office security solutions in the Indian market with, mBell – the smart re-chargeable doorbell which is connected to your smartphone all times. Gone are the days of video doorbells where someone inside the home had to physically peek onto the door and watch hazy unclear video, pictures and crackling voice of the person on the other side of the door. This has been a great security risk especially when both of the parents are working and their children or the old parents are home alone, you wouldn’t know who was at the door. With Portronics mBell – the smart re-chargeable doorbell which connects to the 2.4GHz Wi-Fi network of your home. 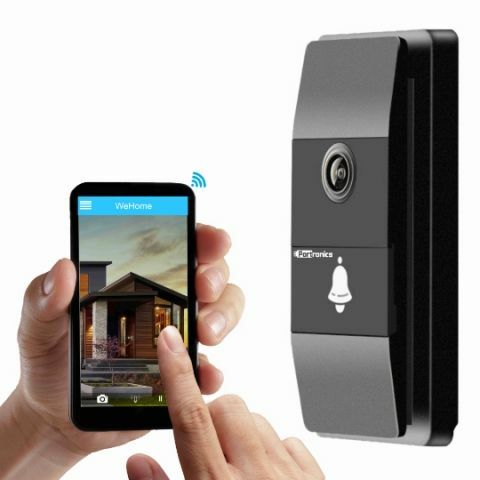 Once anyone presses the mBell smart door-bell, the members of the house will hear a nice chime and can see the person at the door on your smartphone with a720p HD video and can also speak to the person from your phone. You just need to install a free WeHome app on your Android or iOS device. Portronics mBell gives you a bigger and clear view of outside your door with upto 180 degrees horizontal and over 100 degrees vertical view span. Even if the person at the doorstep is on sides of the mBell or at a lower trajectory, you’ll be able to clearly see him/her on your mobile just by moving the fingers on your mobile app screen in the WeHome mobile app. One more key security feature of the Portronics mBell is that it allows you to remotely wake up the mBell to view the outside of your door at any time even if the doorbell is not pressed. Hence, allowing you to sleep peacefully when you are travelling without any worry about your family and valuables at home. Even in the night, mBell allows you to have a clear view with the inbuilt IR Nightvision upto 9 feet. And in case if the outside, street-light or gate-lights are switched off, you’ll be able to clearly see the person on the door. There is also a motion-detection sensor in the mBell as well which allows you to see if there are any movements outside the door. On the inner side of the door, the mBell has a USB charging port, On/Off Button, Reset Button and Alarm button to raise an alarm in-case of an emergency. Portronics mBell also comes with IP67 water and dust proof rating which ensures that even in torrential rain lashing on your door or in a dust-storm, or if the temperature drops to -5C or raises to +50C, your mBell will keep working like the most faithful and always-awake watchdog. mBell is also very tastefully designed to give great looks to your door. Since it works on WiFi and there are no wiring needs, your home will look smarter. Even if you are out of your house for over 3-4 months, you can keep the watchful eye on your home since once fully re-charged; the inbuilt 4000mAh battery can work for upto 3-4 months without needing another recharge. Now going to visit your relatives abroad for summer months won’t be a pain anymore. The mBell is priced at a very striking price-point of INR 10,999/- and is available at all online and leading retail stores across India.